The world famous Black Watch Regiment (42nd Regiment of foot), also the Royal Highland Regiment, can trace its roots back to 1624 when the British government began recruiting "Independent Companies" from the highland clans loyal to the crown (mainly Campbells, Munros and Frasers), formed as militia to police the Scottish Highlands... a policy often described as "taking a thief to catch a thief". Following the Jacobite rebellion of 1715 King George I disbanded these Independent Companies, refusing to trust the highlanders. General Wade was appointed Commander in Chief of British forces in Scotland in 1724 and began a massive programme of road and bridge building to allow his troops to move quickly to nip any further rebellion in the bud. Many of General Wade's military roads remain key routes through the Scottish highlands to this day. Originally 500 officers and men were formed into six "Independent Companies of Highlanders"... three from the Campbells and one each from the Munros, Grants and Frasers. These were the only men allowed to carry arms (legally!). By 1739 and war with Spain on the horizon, King George II elevated the Independent Companies to a proper Regiment of Foot and many young men joined from well-to-do Scottish highland (and lowland) familes ... for their chance to make a fortune overseas and as the only legal way to bear arms and, therefore, potentially to extend one's own family's influence at home. After the Jacobite Uprising in 1745 the British government realised that rather than tie up valuable regular British troops in an effort to subdue the highland clans (remembering the American Wars of Independence were raging), they would be better off using these "wild men of the North" to police the highlands. Contrary to myth, the Black Watch did not fight against the Jacobites at the Battle of Culloden in 1746... the Duke of Cumberland ("Butcher") was pragmatic enough to realise that asking the Black Watch to kill their own kith and kin could prove disastrous and, so the regiment was stationed in the South East of England, to guard against any invasion from France. The Campbell clan, who had been elevated to the dukedom and were staunch supporters of the British crown; the dark blues and green undercheck is based on an ancient Campbell tartan... later, coloured stripes (overchecks) were added to identify different line regiments, e.g. a gold overcheck identified the Gordon Highlanders and so on. 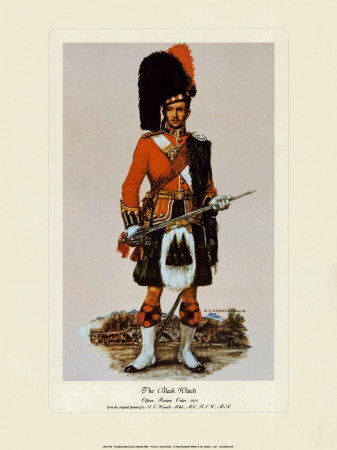 The Black Watch ("Black" in this sense meaning dark, hidden, clandestine, sinister) were initially hated by the highlanders but within 100 years had become one of the British army's most respected regiments, perhaps most famously gallantly conducting themselves as part of the original "thin red line" at the Battle of Waterloo. Throughout the Crimea, the Boer war, both world wars, post-war security emergencies (e.g. 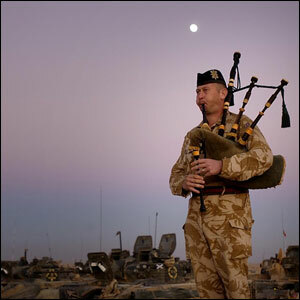 Malaya, Northern Ireland) and most recently in Iraq, the Black Watch remains one of the most respected and, with their distinctive red hackle, most recognised fighting units anywhere in the world. Sadly this proud regiment has been amalgamated into the new "super regiment": the Royal Regiment of Scotland. The Black Watch forms the 2nd Battalion of this new regiment and still proudly wear the famous red hackle. As the "Royal Highlanders", the Pipes and Drums of the Black Watch wear the Royal Stewart Tartan * - Scotland's royal tartan. The tartan itself was never called "Black Watch", but is correctly called, in fact, The Government Tartan. Following the suppression of the 1745 Jacobite rebellion (Bonnie Prince Charlie and a' that! ), the wearing of tartan, speaking of Gaelic, the carrying of arms and the playing of pipes (among other things) were outlawed... a form of ethnic cleansing. For many years the Government Tartan was therefore the only tartan to be worn legally in Scotland. The Government Tartan forms the base of many military tartans, including the Gordon, Campbell, Douglas (Cameronians), Leslie (King's Own Scottish Borderers) etc. The basic check of dark blues and greens make it one the most "neutral" tartans to use, so is often a good alternative if you can't find your own clan tartan produced in a ribbon.